Pre-high school: I ran a lot of local 5ks and a few half marathons. I didn't do a ton of training, but I just had fun, and I got more serious about it as high school got closer. High school: I enjoyed running a lot, especially cross country. I originally did track to keep my in shape for cross country. I ran at Footlocker Nationals, the Adidas Dream mile, Brooks PR Invitational, world xc junior championships, and a few local 5ks. 15K: Blacksmith Fork Freedom Run (aided) 48:10(2013). Become an all-american in cross country and track. Make sure I have fun, not get burned out, and get faster. Eventually get the school records in the 5km and 10km. I recently returned from serving a two year mission for the Church of Jesus Christ of Latter-day Saints in Ghana. I gained 30 lbs. during the service and came back out of shape. I graduated from Sky View High School in Smithfield, Utah. 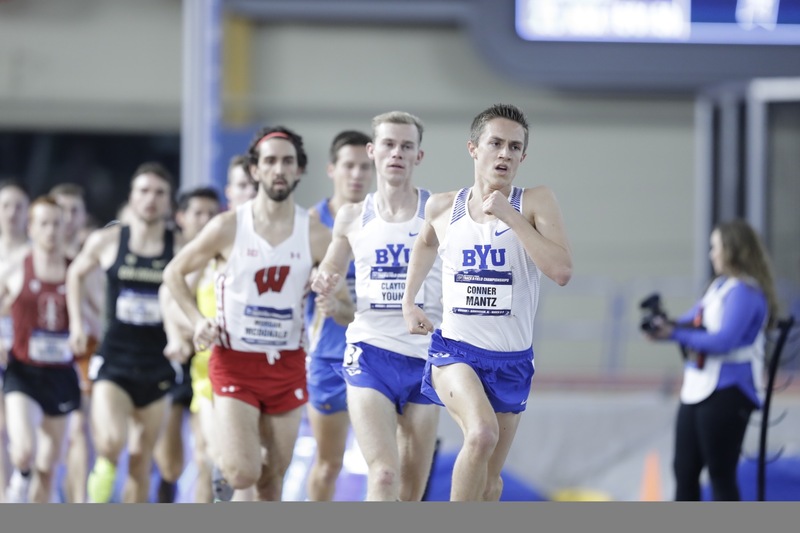 I currently run for Brigham Young University in Provo, Utah. AM-5.2 easy miles with Talem, Josh, and Michael. PM-7 miles on grass and then strides. AM-Long run for the week. Wasn’t too long, but felt good. PM-2x(1000 at tempo, 600 at 1:35, 400 at 61, 300 at 44, 200 at 28 and 26) pretty easy workout. PM-10 easy miles watching a time trial for some of our teammates, and then strides. PM-It wasn’t my best race, but it wasn’t terrible. My teammates ran great, Clayton placing 3rd and McMillan placing 4th! Wish I had more time to write about this race, but due to school and other responsibilities, I've fallen behind on the blog. Warmed up about 2 miles with Clayton and McMillan. Felt a lot more loose this time around then yesterday. After reviewing yesterday's race, I seem to figure out that the problem with the race for me was I was so outcome orientated. I wanted top-3 and thought I'd worked for it, was in great shape, and I expected that the execution process would take care of itself without the effort that was necessary in the qualifying races. Well, after realizing this, I told myself at the start line that I needed to enjoy the race and be ready for everything. At the start line I told myself that there was no where else I'd rather be than on the start line for this race. The gun went off and I got out well. The 3k is easier to prep for because you know that it's fast and hard, and that pacing isn't really something I do. I just run hard in the 3k, and let what happens happen. At 150m we came across the cut in(I was on teh outside waterfall start) and I let instincts kick in. I took the front from Clayton. He said, "Have some fun out there Mantz." and I decided to push. I tried to keep pushing the pace, but I could feel that it wasn't there. I heard a Coach yelling that we were running 32 seconds per lap. This was frustrating, but I just kept pushing. Around 1600m Robert Brandt passed me. There was a fall while I was leading it and Clayton, who was still right behind me, yelled at me to keep going (I had looked back when it happened) and then I sped up. As the race went on McDonald made his move, and with 300m to go, I was in the top-5 pack. The sad thing was I felt like I was all out kicking to keep up at this point; however, I felt great. Until 150m to go. Then I booty locked, got passed by 2 people, almost 3, and I just dug enough to make it to the finish. Last 400m was 58.2, which is one of my best kicks. I was so relieved to finish 7th. I had the goal of top-8 in this race because it seemed realistic and out there. After the race, Clayton, McMillan and I went on a long cool down. It was a good weekend for us, and with just the 3 of us, we finished 13th at nationals, which was fun. Clayton led the team, finishing 3rd and 6th, McMillan finished 4th and 11th, and I finished 10th and 7th. While this weekend was slightly disappointing, I learned a lot, and I'm excited for outdoor track season. During our cool down, Clayton jokingly said that he would race us to the end of a road. The road was about 400m long, and sprinting it hurt! But it was fun. AM-5 easy miles with Doc Hunter on the grass. PM-Just under 11 miles. Watched the team run a killer workout. Jared Ward was there and he is in incredible shape. Should be fun watching his half marathon this weekend. AM-6.6 miles, went on my regular route and then past by the track and heard Doc and Micah and went and ran with them for a bit. PM-10.7 miles, mostly grass loops mostly with Clayton while we watched the other guys workout. It was a good run. AM-11 miles, some strides thrown in. PM-A little over 5 miles. AM-Beautiful long run with some of the guys, we started in Bluffdale and went to South Jordan area and back. Great weather, suprisingly, and I felt pretty good. We averaged just under 6 minutes per mile as well, which made it a little more fun. AM-5.2 easy miles with Michael, Josh, and Aidan. PM-12 miles, a grass loop, and then strides on the track. AM-5.3 easy miles with Michael. We extended onto grass loops instead of our regular extension and we ran with Rory, Doc, and Micah for a bit. PM-Tough day. So, I was pretty confident about today being a good day to start workouts again. We ran 2x(mile, 1200, 800) with about 400m jog recovery between. We got out pretty fast and I felt pretty good. The first mile was in 4:23, so nothing too crazy, but I was a bit surprised at how it started to feel a little less smooth at about 1500m. Then the workout went 3:15, 2:07, 4:22, 3:14, and 2:05. On the last two repeats, I was feeling more fatigued than usual and so Rory led and took the wind for me. It's great having teammates who are willing to take some of the hard work. PM-Michigan workout with 1200m on grass instead of track. We went 4:27, 4:55, 3:21, 4:47, 2:08, 4:45, 60, 4:39. Felt pretty sick today, but was able to still run without any problems. AM-18 miles up the canyon and on Murdock. AM-4 miles with Talem and Michael and then two on my own. PM-5x800m, 2x400m. Race wek so the workout wasn't too killer. At first Coach said 3x800m and 2x400m except for Rory, Milly, and Clayton. I wanted in on that, but wanted to see how I was feeling. The first two were 2:06 and 2:07. I felt good, so I asked Coach if I could do an extra one. He agreed. The next two were 2:06, 2:04. I expected to finish after this, but then Coach had us do another one at 2:05, and then we did two 400s at 62 and 59. Felt pretty good except for the fifth 800m. PM-Medium Long Run. 12.7 miles with strides. PM-Race: So this meet we weren't really taking it too easy training wise, but just to work hard in teh week and then to run with whatever we had left. I had planned, if Coach didn't say anything, to try and push the pace and make it a quick race. When disucssing the race plan with Coach, he said that I wasn't allowed to lead atleast until a mile to go, so my plan was to just chill until then and then react to any moves. Warmed up with Danny and Clayton, had a good start, and then just fit myself in the pack. The race didn't feel very quick. We were running about 68-69 seconds per lap, and I just stayed in the middle of the pack. I wanted to move up, but knew there was no point early on. At 3k or so, the pacer stepped off. I stayed in the same place. At 5k we were 14:18, which was slower than I wanted, but I stayed patient. The pace was all over the place. I got right behind Clayton after 5k. It felt very familiar to be right behind him, and I'm used to his pacing, so it felt easy running behind him. At 8 laps to go, I didn't think we would run my goal time of 28:20, especially after we ran a 70 on lap 17 or 18. When Clayton heard this, he went to the front, and I followed. When he got up there, he looked around, and then took the lead and pushed the pace. I went with him, but was being thrown around for a bit by other runners. After that I just stayed on Clayton's tail. I wanted to pass him, but wasn't sure if I could continue dropping the pace. As every lap went on, I felt better and better. With a lap to go, the announcer said we had a gap on the field, so I looked back. I then tried to get on Clayton's outside and pass him, but he kept the pace quick, and with about 50m to go, I passed him. I could tell he wasn't sprinting all out because he never has problems responding in practice and I was right. He was smiling as if it was a workout. AM-Rough long run. Up a hilly area near the campus to a beautiful lake where a woman on a horse informed us that we were on private property that, supposedly, had a lot of signs that we never saw. It was pretty, but good to have over with.